OUR SURVIVAL DEPENDS ON US: A cautious crafted piece of art! INGLORIOUS: The Road to Maturity! SEVENTH WONDER: Finally Another Masterpiece! CRUACHAN: Veterans of Celtic Irish metal! SOLSTICE: Eminent heavy/doom metal masters return with a bang! This one-man-project from the French multi-instrumentalist Stephane Thirion – founded in 2014 – comes with its third full length album. On ‘A Fleur De Peau’ he creates an intensive mix of Swedish death metal in the vein of Entombed and Dismember and black metal, while we can notice any thrash metal tightness as well. The title track opens rather atmospheric, with piano, violins and drawling mysterious sounds, but next we are indulged into quite brutal exposures during eleven compact songs long. The wall of guitars has – in despite of heavy distortion – quite a transparent sound and the vocals pierce you to the very marrow. Under the surface one might notice any melodic soloing, but as a whole, this impressive wall of sound lacks necessary variegation. Dit eenmansproject van de Franse multi-instrumentalist Stephane Thirion – opgericht in 2014 – is al toe aan een derde volledig album. 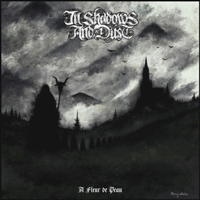 In Shadows And Dust produceert op ‘A Fleur De Peau’ een intensieve mix van Zweedse death metal in de trant van Entombed en Dismember en black metal, terwijl er ook nog wat thrash strakheid te bemerken valt. Het titelnummer opent op atmosferische wijze met piano, violen en slepend mysterie, maar dan is het elf compacte songs lang van dik hout zaagt men planken. De muur van gitaren heeft ondanks de overmatige vervorming een transparante klank en ’s mans stem snijdt door merg en been. Onderhuids vallen er melodieuze solo’s te spotten, maar als geheel lijdt het imposante geluid uiteindelijk toch onder te weinig variatie. •	 OUR SURVIVAL DEPENDS ON US: A cautious crafted piece of art! •	 INGLORIOUS: The Road to Maturity! •	 SEVENTH WONDER: Finally Another Masterpiece! •	 KING OF ASGARD: A Monument In Viking metal! •	 New album & single Grimner to come! •	 WISDOM: Wise Men Speak Again! •	 CHAOSTAR: Dé revelatie van Metal Female Voices Fest 2013! •	 FUROR GALLICO: Seminal Debut from Italian folk metal band! •	 THE POODLES: Groot In Zweden, straks de wereld? •	 OCTOBER TIDE: A Ravishing Resurrection! •	 Le Grand Guignol: Something is Art when it inspires me to be creative. Dark and guitar oriented extra strong songs from the Greeks! A giant leap forward for this band! The essence of traditional doom reigns! Website in order to promote heavy-metal & hard-rock to a broader audience in Flanders but also in the entire world. No part from this website may be used in any other publication whether in print or on the world wide web without the editor's consent.